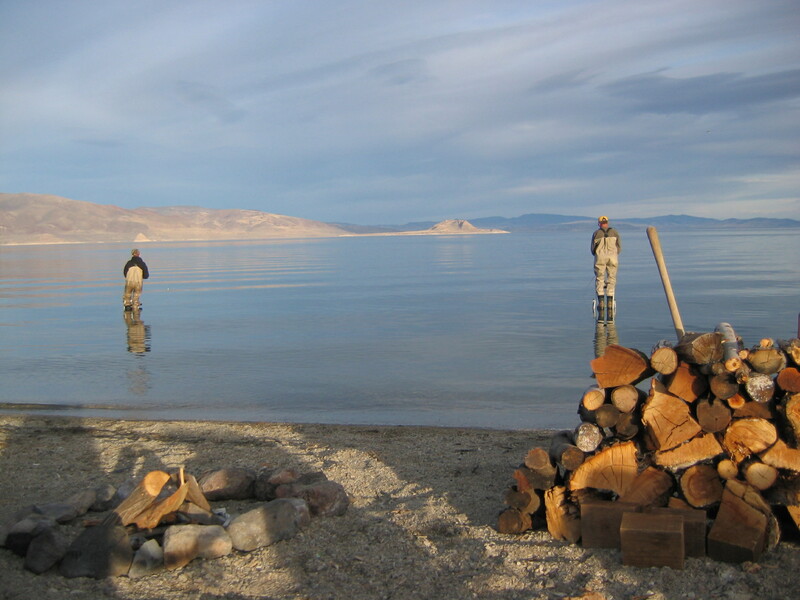 There are miles of beaches to fish around the shoreline of Pyramid Lake. The best part about it is you can always find a spot where there are no other anglers. One of the biggest fallacies about fishing Pyramid (especially in the spring) is that it gets crowded. The lake is 15 miles long and 11 miles wide, it is a winter-time fishery and it is in the state of Nevada. There are some popular beaches that draw crowds but there is never a day at Pyramid that you can’t find a place to fish with little or no other anglers. One of the best things about many beaches at Pyramid Lake is you can drive right to the edge of the lake and fish near your car. Note that some of the beaches at Pyramid have areas of very soft sand. If you are not familiar with the lake the safest practice is to only drive on beaches that are packed down and have existing tire tracks from other vehicles. Shallows – These are beaches that do not have much of a drop-off or do not offer access to deeper water within casting distance. In most cases shallow beaches are no more than 5 or 6 feet deep. Standard Beaches – These areas are the most common at the lake. As you wade out into the lake to fish, you are able to reach ledges and drop-offs that are in 6 to 12 feet of water on a long cast. Deep Drop offs – These areas allow anglers to cast into 10-30 feet of water. In most of these areas it is important not to wade out too far. Some of these beaches also allow anglers to fish from dry ground and access deep water. Points and Rocks – There is an abundance of Tufa rock at Pyramid Lake creating many rocky outcroppings. Some are wadeable and some offer fishing from shore. Below are some of the more popular beaches around the lake and a little on what each has to offer. The list starts on the South end of the lake and moves North around the West side. The East side has very little vehicle access and has some special regulations concerning usage so it is not included here. Dago Bay– Currently Closed Dago is a huge beach that is rarely crowded. It has a varying degree of drop-off depending on water levels and how far down the beach you fish. It is more shallow to the East and gets deeper going West. Water levels have a great impact on Dago Bay and whether or not you are able to wade out to the ledge or shelf. On years when you can, it can be a sleeper. In the fall, fish can be seen chasing bait in the shallows from time to time. In the spring, Tui Chubs and Cui-ui spawn in this area. Tips: Be careful driving to the waters edge and only if you have a 4 wheel drive. For indicator rigs start with your bottom fly around 7 feet down and go from there. For shooting head set-ups, log casts will get you into around 10-14 feet of water so a 20 second countdown is a good way to start. Howard’s Beach – Currently Closed Located just to the East of where the Truckee River dumps into the lake, it has both Standard and Deep beach characteristics depending on what part of the beach you are on. It tends to shallow out further down the right side of the beach. Large enough for a big group and can hold fish at any time of the year. Like Dago it can be tricky to wade out to the ledge. Fish are often caught on this beach up on the shelf in shallow water, especially in the spring. Although north winds are ideal at Howard’s and Dago, it can also make them unfishable if the wind is too strong. The main spawning area for Tui Chubs and Cui ui in the spring. There is some really deep water not too far out from Howard’s and fish can move in and out of the shallows in a flash. Indicator rigs can be fished at anywhere from 7-12 feet depending on where you are and how far you can cast. Shooting head set-ups can reach up to 20 feet of water is some areas. Popcorn – A shallow area for sure. Not much of a drop-off no matter how far you wade out. There can be tons of bugs hatching around this beach due to the more mud-like bottom and much less alkaline water. This is due to the Truckee flowing into the lake just to the south of Popcorn. There is a very small boat ramp at Popcorn. It is nice for boaters who are looking to fish the south end of the lake. It is however, very small and can only handle boats under ~20 feet. There is a Sandy Point just to the North of Popcorn that faces to the South. It is really popular and gets very crowded. It is possible to fish this area without waders. The drop-off is extreme and the water can reach 15-20 feet with a long cast. The point area facing to the South can be 8-12 feet. Lots of big fish have been caught in this area in the past few years. Cattle Guard – A small beach just to the north of Popcorn. Not too much exciting about Cattle Guard except for it is usually empty. The drop off is fast to the North and mellows out a bit to the South. This is another area that does not always require waders and on days with a big West wind it also offers some protection. There is a small spring or run-off area that dumps into the lake around Cattle Guard. You never know when Big Red is going to be checking out the fresh water coming into the lake. Block House – A very deep drop-off beach. No need to wade into the water here unless you are fishing the northern most end. This beach is very popular with conventional anglers and those who forgot to bring their waders with them. It is not uncommon to see large schools of Tui Chubs roaming the deep drop-offs around Block House. especially in the fall and early winter months. Spoons and Jigs are popular here as well as really fast sinking fly lines and weighted flies. Sand Hole – Similar to Block House in that you can reach 20-30 feet of water right off shore with shooting heads or lures. Make sure to use a fast sinking line and let it sink before starting your retrieve. Nymph fishermen often catch fish under an indicator right on the drop-off. Fish can be seen cruising the vertical drop right off shore, especially in the spring. They will also grab your Woolly Buggers as you drag them up the shelf right in front of you. Be careful wading out, you can step in over your head if you are not careful. The beach is kinda soft so also be careful driving and parking. Indicator rigs can be fished anywhere from 9-12 feet at Sand hole and even deeper water can be accessed with shooting heads. Wino Beach – Most anglers fish this beach because of the deep drop off it has. It is a much larger beach than Sand Hole. There are many points and drops due to the exposure this beach gets from winter storms. It is ever changing from week to week depending on the wind. The cool thing is that it can feel like a new spot from one week to the next. Deep water can be accessed from the shoreline like Sand Hole. The further north you go at Wino, the more it fishes like a standard drop-off beach. Fish can be caught any time of year here and it is very popular with the locals. It is a little difficult to add information for indictor fishing here because the beach varies so much. This is a good place to have a couple of large split shot with you to cast out and sink your indicator to judge the depth. Tamarack – A very overlooked beach. It has more of a standard type drop-off, is rarely crowded and has a large stand of willows right on the beach. It can be a great place to camp if you are in a tent or pop-up. The willows can really help block the wind on a blustery night. There is some clay and rocks in the water that can make it a little tough to navigate sometimes. Indicator rigs can be fished around 7 feet here but do not be afraid to check the depth. The Wash – Formed from a flash flood many years ago. It can be a little confusng to get to on your first try. You actually spend a bit of the drive in the wash itself getting to the beach. It has a standard drop-off and can really hold some fish from time to time. Indicator rigs should be between 7-9 feet depending on the cast. This is a really sandy beach and is a great place to cast shooting heads right on the bottom. South Beach – This beach became popular in the years that the nets beaches were closed during the spawn. Although this is not an issue anymore, South Beach remains a popular area. Large enough to hold 20-30 anglers and a great camping spot makes South Beach a worthy fishing spot. It has a shallow drop-off for the most part and is a great springtime nymphing beach. North winds can bring in large schools of fish but be careful if they get too strong. Many a fisherman have been blown off or lost their ladder at South Beach. Indicator rigs can be fished from 6-8 feet here depending on which part of the beach you are on. This is also a great place to cast a shooting head. South Nets – The largest beach on the lake, the most popular, the most crowded and the closest beach to the hatchery on the south side. Be ready to fish with other anglers if you choose to fish here. It is a very shallow drop-off beach and can hold fish any time of the year but especially in the spring when fish are in the shallows. It is a great place to camp but don’t sleep in too late or you will not get a spot to fish in front of your campsite. This beach is over-fished due to its proximity to the hatchery and it’s convenient location. Anglers will spend their whole day at this beach whether they are catching fish or not. Don’t be fooled by the crowds here, check it out and if there are not some rods bent go somewhere else. Note: There is a boundary 1000 yards from the hatchery. It is illegal to fish any closer to the hatchery regardless if you are on shore or in the lake. Indicator rigs should be fished between 6 and 7 feet here. Shooting heads are also a great way to fish this beach with around a 15 second count down. North Nets – The 2nd most popular and crowded beach at Pyramid Lake. It borders the hatchery on the north side. The North Nets has a really good drop-off and can be fished any time of the year. Like the South Nets, anglers will fish this beach all day regardless of their success. Big fish are commonly caught here. A lot of anglers, proximity to the hatchery and the perfect drop-off all play a part in the lure of the North Nets. This beach is considered a family beach and alcohol is not permitted. Like the South Nets, there is a boundary 1000 yards from the hatchery which is clearly marked. The North Nets is a little deeper than the South Nets and Indicator rigs can be fished from 8-11 feet depending on how far out you are. There are usually lots of anglers fishing shooting heads and Jigs with spinning rods. The anglers get pretty tight at this beach especially down to the South end near the Hatchery. Notes on fishing the Nets areas – the stream running out of the hatchery only flows in the spring during the spawn. This is usually when these two beaches get really crowded. When the water is not flowing, there are plenty of other locations to fish with less anglers. Our theory is if there are 50 anglers on a given beach and 1 big fish is caught then you have a 2% chance of it being you. Plenty of fish are caught on no-name beaches. 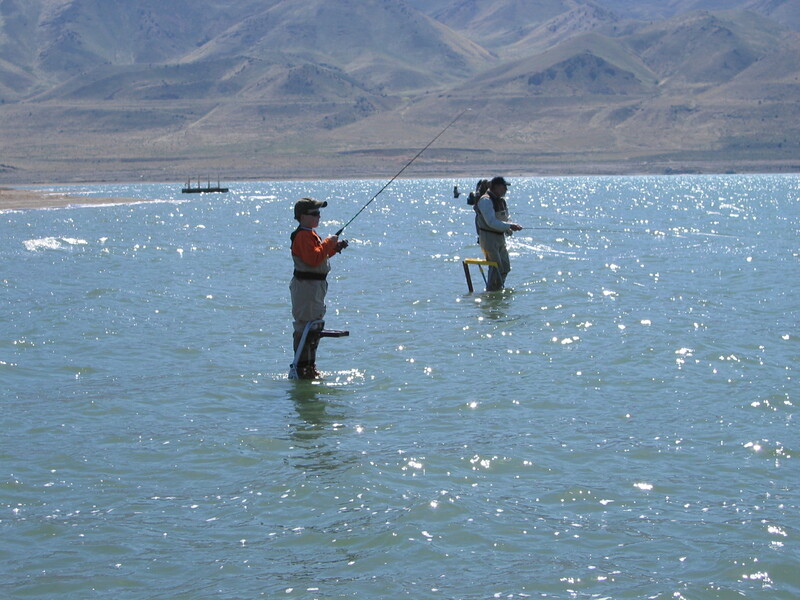 The really good Pyramid Lake fishermen have many places and tactics to land these huge trout. The Marina – This area is located just to the north of the North Nets directly in front of Crosby’s lodge. It used to be the main boat launch area at the lake. Over the years, storms have made it tough and expensive to keep the boat ramp open and it is not a working launch anymore. The beach is really nice. There is a great drop-off and there are also some rocks to fish around. There are some picnic tables to use as well. This is a family beach and no alcohol is allowed. A great place to fish when the Nets are crowded. Seperator – Located just to the north of Sutcliffe, Seperator is a little cove that has some wind protection. The drop-off changes a bit from year to year and you just have to check it out from time to time to see what is happening. It does not get fished as much as in years past. The best part of the beach is directly to the South of the rocky point. This is another popular camping beach. Indicator rigs can be fished from 7-9 feet here. In the past few years there has been quite a bit of moss on the bottom which brings in the bugs but makes it a little tougher on the Shooting head set-ups. Pelican Point – This area is really big and offers a bunch of different fishing opportunities. The point that sticks out shelters the long beach from the north wind. Although the best fishing is usually when the wind is coming into the beach, it can serve as a nice north wind block on days when it is tough to find a beach to fish due to weather. It is also the main boat launch at the lake. Pelican is a great place to camp and even the largest campers can access this beach easily. Pelican is the 3rd most fished beach at the lake. The rocky area to the south of Pelican is a popular float tube area. If you are fishing out of a tube or pontoon boat in this area, stay out far enough to give the shore fisherman plenty of room. Tubers fishing this area commonly spook fish into deeper water. Indicator rigs fished off the sandy beach should be fished 6-8 feet down and the beach is a great place to cast shooting heads. Lots of big fish are caught at Pelican in the spring months. Windless Bay – This beach faces North on the north side of Pelican Point. A great wind shelter from a south wind. It is a pretty shallow beach. Not too much of a drop-off and most of the fishing is done in less than 7 feet of water. Windless offers another great camping option. This is a good beach to fish in the spring when the fish are roaming the shallows. Be careful not to wade out too far. When the fish are in they can be really close to shore. Warrior Point – Warrior is located at the end of the paved road heading North out of Sutcliffe. There is a really nice beach facing to the north and can be a great wind block on days when there is a strong south wind. It is a big beach that has a a moderate drop-off that gets gets deeper as you head out towards the point itself. This beach can be a sleeper and is worth checking out from time to time. Indicator rigs can be fished in 6-8 feet of water and even a little deeper towards the point. Monument Rock – Currently Closed Monument is north of Warrior off the dirt road that continues on after the pavement ends. To get to it, take the 2nd right after you pass the cattle ranch. Most anglers fish to the north side of the rock that is called Monument Rock. It is a very big sandy beach that can fish really well. It is rarely crowded and is worth trying. There is a decent drop-off and can be fished in a variety of fashions. The beach has a few soft spots so be careful driving around. Indicator rigs can be fished from 9-14 feet here depending on where you are on the beach and how far out you are fishing. The dirt road is in pretty bad shape as of March of 2014 so take your time as there are a lot of wash boards along the way. make sure you have a 4 wheel drive to access this beach. There are many more places to fish around the lake that are not listed above. These are just some of the more popular beaches around the lake. Due to the fact that Pyramid Lake has very little structure, fish spend a lot of time roaming in search of food. You can catch fish anywhere around the lake. The #1 rule is don’t leave fish to find fish!